Our pulpy friends over at 2002 Hogback Road have gotten their hands on the latest version of Mitsubishi's Evo, the Evo X. 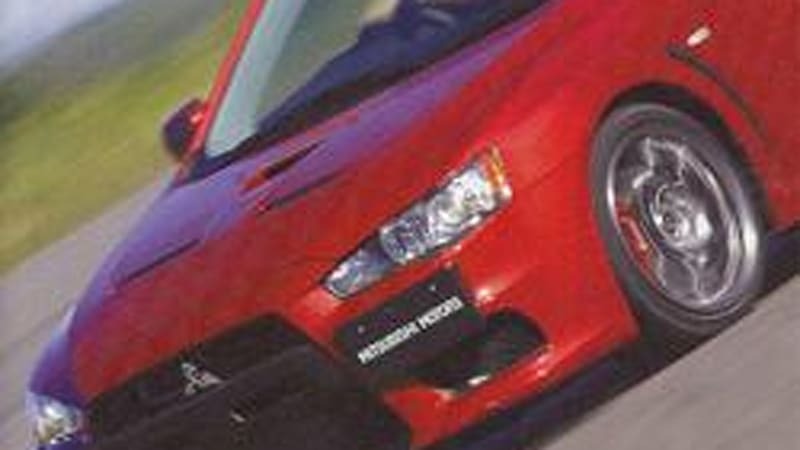 Car and Driver's November 2007 issue has a preview of the Evo X, and they found that while the new car gives up speed to the outgoing model in a drag race, it kicks it in the teeth if curves are on the menu. Any car that can run a 13.8-second quarter mile is not slow, anyway. Consider that you get that kind of speed for a base price of $30,000, and 295 horsepower from two-liters is impressive. C&D's numbers are from the Evo GSR, and a JDM one at that, but changes for US-bound Evos are down to details. Putting the 295 horsepower and 300 lb/feet of torque to the ground in a seamless manner is a bucketful of acronyms. There's a new dual-clutch sequential gearbox called Twin-Clutch SST that is bolted to four coordinated systems that get the overall descriptor of Super All Wheel Control. S-AWC combines a center differential with yaw control, stability control, and a rear differential with separate clutches for the left and right wheels. The structure is stiffer and lighter, and in the boy-racer arena, the Evo's always been a sweet driver, which hasn't changed. In fact, the character of the car has become a little less uncouth, which purists may cry about, but the rest of us will just giggle like schoolgirls as the Evo X replicates the video game experience IRL.